Blurb on the bottle: Inspired by the eerie wrecks of old smuggling ships along the Suffolk coast, this ghostly pale ale has good assertive pithy bitterness with a malty backbone and a lemon and lime aroma. Adnams Brewery: According to the all-knowing Wikipedia, Adnams is a British regional brewery company founded in 1872 in Southwold, England. It brews cask ale and pasteurised bottled beers, with an annual production of around 85,000 barrels. Okay, that sounds good to me, let’s give this beer a try. 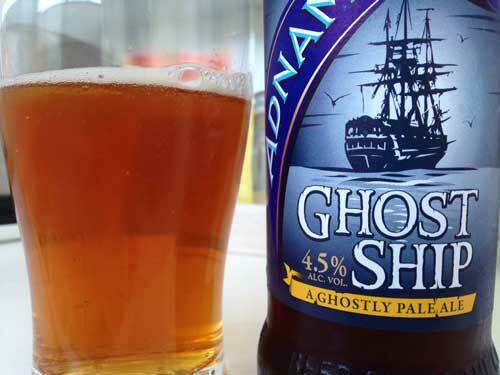 Tastes like: Adnams Ghost Ship is neither ghostly nor ghastly. Indeed, I enjoyed it so much that when a tiny little insect flew into my glass of beer and began to drown in the bubbly amber nectar, I thought to myself “that’s not a bad way to go – drowning in a pool of beer”. Naturally, I picked the annoying little insect out of my drink and flicked it away. That’s one of the few downsides of drinking beer outside this time of year. But I digress. Adnams Ghost Ship was a great deal fruitier than I was guessing (with a name like ‘Ghost Ship’, I was half expecting it to smell like the sea), with a zesty aroma of peach and mango. It had a slightly fruity taste, too – a hint of grapefruit, I would say, and a sweet caramel, biscuity finish. As you can see from the picture above, Ghost Ship pours a rich amber colour with a thin white line of foam, which stuck to the glass while I drank this beer down in record time. Is it the best beer ever? Well, Adnams Ghost Ship is certainly the best beer named after a paranormal vessel that I’ve ever drunk before. The Adnams Brewery can put that quote on the label if it likes. All joking aside, though, this was a nicely drinkable beer that goes down very well indeed. Well-rounded and reasonably light and tasty, this beer is a crowd-pleaser that certainly pleased this beer reviewer. Thanks to my sister for gifting me this beer for Christmas!